The whitetail subspecies ochrourus is commonly referred to as Northwest whitetail, occasionally Idaho whitetail. This subspecies is marked by large body size, bucks from 250 to 300 pounds common, and conspicuously darker pelage than Dakota whitetails to the east. Northwest whitetails inhabit the Palouse breaks and mountains of the Inland Northwest, including eastern Washington, Idaho’s Panhandle, far-western Montana, northeastern Oregon, northwestern Wyoming, southern British Columbia, and a small portion of southwestern Alberta. Northwest whitetails often live above 6,000 feet elevation, alongside elk in most of its range, commonly sharing its habitat with mule deer. Overall, Northwest whitetail do not garner the press or attention afforded other whitetail subspecies. This might be attributed to the region’s abundance of other big-game options, or the fact area hunters do not seem particularly concerned with keeping score. Of all the whitetail subspecies, the Northwest strain likely offers the vastest and accessible tracts of public lands and over-the-counter tags. National Forest Service and private timberlands open to the public for nominal land-use fees stretch from one flank of its range to the other. Farm and private ranchlands certainly exist in Northwest whitetail habitat, and they can have some influence in choosing hunting areas, though a larger portion of the population is found in mountainous big woods. Private lands tend to comprise more open habitat—hence easier hunting—in the Northwest whitetail’s range, but unless they are specifically managed for hunting they tend to be shot out quickly. Many landowners in this region do not tolerate wildlife competition of any kind, and fish & game departments indulge landowners with aggressive depredation programs, including seasons and tags issued outside traditional hunt dates. These problems largely don’t exist outside private agricultural lands. Non-resident aliens wishing to hunt Northwest whitetails in British Columbia or Alberta, Canada, must hire a registered outfitter. When Lewis and Clark arrived in the region now known as northern Idaho during the Corps of Discovery Expedition while exploring the recently-acquired Louisiana Purchase, the team nearly starved due to a complete absence of game. Today Northwest whitetails thrive in this very region, in many cases, expanding into new territories. This can be attributed largely to clear-cut logging, though the practice of grain farming also factors significantly. As ugly as the practice of clear-cut logging might appear, it removes old-growth coniferous trees which provide no nutritional substance to big game and allows the growth of deciduous vegetation and forbs highly beneficial to ungulate health. Natural forest fires once performed this function, but never on the grand scale of modern timber harvest. Compared to most northern whitetail subspecies, the Northwest whitetail ruts a bit later than most, their rut beginning around the middle of November and running through (maybe) the first week of December. This relatively late and highly-truncated breeding season assures fawns drop after the snow has melted and warmer weather arrives but before the annual dry season. Another trait particular to Northwest whitetail is they often migrate great distances—30 to 60 miles—to remain ahead of snow accumulations at higher elevations, dropping to lower ground to winter. Hence, it is unusual to witness the same bucks year to year at a given hunting site. Its vast habitat—despite mountain lions, reintroduced wolves, behemoth coyotes and sometimes intense hunting pressure—means many bucks die of old age. Tagging 7 ½ to 9 ½ year old bucks isn’t uncommon. Hunting these huge big woods provides one of whitetail hunting’s biggest challenges. Deer populations are thinly distributed or found in pockets, vegetation typically thick and deer intensely predator wary. Early-season bowhunters usually sit stands overlooking isolated springs, feral fruit trees or crop edges, guarding major scrapes as the rut kicks off in November. Rifle hunters tend to gravitate to open clear-cuts for long-distance reconnaissance. 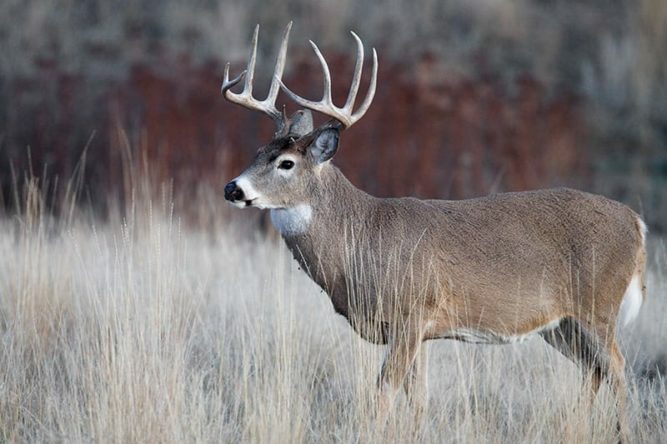 Idaho: The Northwest whitetail is most common in the Panhandle of Idaho, its original range, but has slowly spread across the state anywhere habitat is suitable. The Gem State’s highest-scoring bucks tend to originate from counties north of Interstate Highway 90. For more information, visit https://fishgame.idaho.gov/. Montana: Big Sky Northwest whitetails are generally discovered most reliably west of the Continental Divide, particularly along the Sawtooth Range of the far western border of the state. To the east of the Divide Northwest distribution overlaps Dakota whitetail in most areas. For more information, visit http://fwp.mt.gov/hunting/. Oregon: The highest densities of Oregon Northwest whitetail occur in the northeastern portion of the state, most notably in and around the Blue Range Mountains. Oregon’s Union, Wallowa and Umatilla counties offer the best bets in the state for hunters seeking this species. For more information, visit https://www.dfw.state.or.us/. Washington: Northeastern and northern Washington is a trophy-whitetail sleeper. Northwest whitetails are found in this region from rolling plains to evergreen mountains, with whitetails slowly moving south and west to pioneer habitat once dominated by mule deer. For more information, visit https://wdfw.wa.gov/. Wyoming: Northwest whitetails are most commonly found along the rivers and drainages of the northwestern portion of The Cowboy State, extending south toward Utah, and east to mix with Dakota whitetails in the central portion of the state. For more information, visit https://wgfd.wyo.gov/. British Columbia: Southern British Columbia to the western flanks of the Cascade Mountains is where you will find Northwest whitetails in this province. They have been observed as far north as Fort St. John, British Columbia. For more information, visit http://www.env.gov.bc.ca/fw/. Alberta: Northwest whitetails can be found in mountain and foothill habitats in the southwestern portion of the province, spreading east until eventually intermingling with adjacent Dakota whitetails. For more information, visit http://www.albertaregulations.ca/huntingregs/. Daniel Hawthorne took this nice Northwest whitetail in Washington.